We can't believe that today was our last day, and that we will be coming home tomorrow! We had an entertaining last day at l'Abbaye Saint-Jean des Vignes. Once in the workshop, we had to mix the material. It was made of sand, water, and a white powder that is the same substance used to make white chalk. The children each got to stir the mixture while making sure not to make to much dust. Once it was ready, they used their trowels to spread the mixture onto their brick that they had been given as a sort of canvas. We made sure to make a very thin layer, so that it would dry faster. As soon as our layer was smooth, we were given paint and got to choose our design and our paintbrushes. Some children didn't use a design as a model but created their own instead. We were very impressed with their creations. It was definitely challenging to paint on the wet mixture without making any mistakes. Once we had finished our frescoes, we went to collect our picnics to have lunch outside. We had plenty of time to have a leisurely picnic outside in the beautiful sunny weather as well as for the children to have some free time to run around. At 1:30, our guide, Micha, met us to start our treasure hunt in the Abbaye. 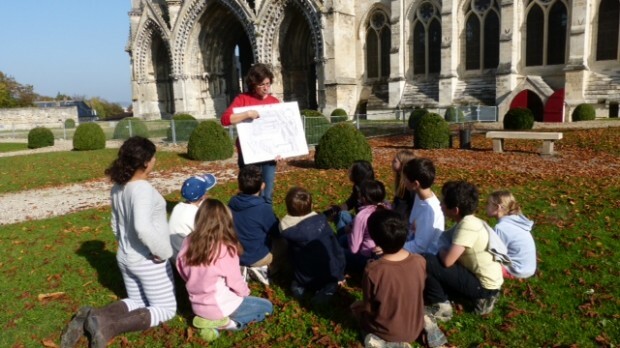 She took us back in time to the 13th century when monks lived in this abbey, and through the letters of Frère Jacques (made up based on the song), the children found their way around what is left of the abbey to find the next clue. We learned all about the life of a monk at the time, and our guide was impressed with the vocabulary and knowledge of the Middle Ages that our children had. She complimented us several times on our group and to,d us what a pleasure it had been to work with us. We were so proud of our students! The students learned about the seven prayers that the monks had to do a day, starting at 2:30 in the morning! They learned how the monks had to eat in silence, and they only ate one meal a day. We saw the menu of what they would have eaten during a typical meal. 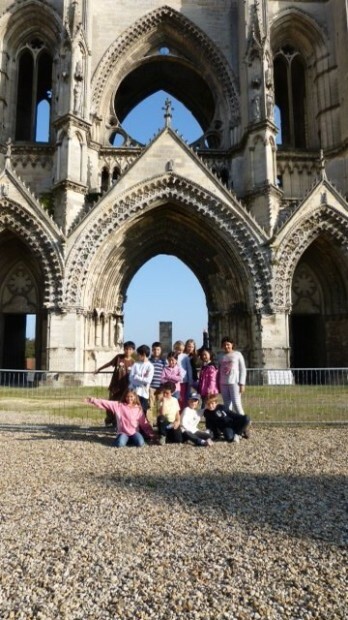 We learned about the construction of the abbey and how the ceilings were not flat but constructed as a "voûte". The children even got to construct a "voûte" using blocks designed for this purpose. When they took out the temporary supports, the trick was to see if their ceiling still held. Several groups were successful. Once we finished building, we discussed the new words we had learned during our trip back in time to the Middle Ages. During our ride back to Blérancourt, Agnès had the excellent idea to buckle the seat belts around the crates that held our frescoes, so that they would not fall and break during the drive. It was a funny sight to see several rows of buckled in fruit crates filled with beautiful frescoes. 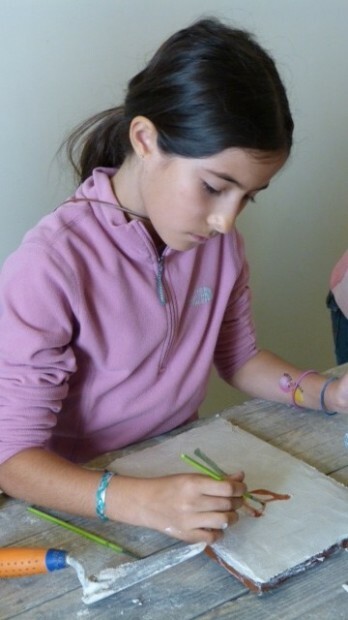 The host families picked up the children, and the big discussion was how to pack the frescoes carefully in the children's suitcases and the need to finish packing. Tomorrow we meet at 5:30 am and will be on our way to the airport before 6 am. It's been a wonderful trip, and although the children are sad to leave, I know they are also happy to return home to their families.